If realism is the recognition of things as they actually are, the Christian is of all persons the most realistic. He of all intelligent thinkers is the one most concerned with reality. He insists that his beliefs correspond with facts. A.W. Tozer (1897–1963), Of God and Men. He wants God for his relief but not for his rule. Dale Ralph Davis, The Word Became Fresh: How to Preach from Old Testament Narrative Texts, p.97. John Wenham dates the synoptic gospels in his book Redating Matthew, Mark and Luke. He interacts carefully with the gospels, the early church fathers, Josephus and others. He gives provisional dates for the gospels and Acts. His dates for the other books represent his general approval of F.F. Bruce in Acts of the Apostles and J. van Bruggen in Die geschichtliche Einordnung der Pastoralbriefe (The historical classification of the Pastoral Epistles). In his book Redating the New Testament John A.T. Robinson (1919–1983) argues for dating all of the New Testament before 70 AD. Though Robinson is not overly conservative and he seems to allow for an errant text, he takes the internal evidence and the early church fathers seriously. His dating seems consistent with a high view of Scripture. He dates some of Paul letters from his imprisonment at Caesarea, though others would place the letters during his latter imprisonment at Rome. Note how early he dates the Pastoral letters. The Robinson scheme has all the books completed prior to the destruction of the temple in 70 AD. Various historians date the composition of the New Testament books over quite a long range of time. Liberal dating has been quite late though I suspect there has been motivation to date the books well after the time of Jesus. While conservative dating has been closer to the crucifixion it may have still been affected by the liberal position. It has been said somewhere that today's conservative theology is yesterday's liberal theology. I am most interested in those chronologies that take the internal evidence of Scripture seriously, or at least are consistent with this approach. Here is the English Standard Version Study Bible's dates for various books in chronological order. A range represents uncertain dating. The study Bible states early, mid and late decade for some books and I have assigned these terms an approximate date. Nor when we detect intelligence in more ordinary situations do we worry about making arguments from ignorance, or generating infinite regresses, or running afoul of Hume's critique of analogical reasoning. Neither would we deny that something as interesting as specified digitally encoded information requires explanation. Instead, in hypothetical and real-world cases, the inference to intelligent design as the best explanation for the origin of specified information is straightforward and unproblematic—except, for some, when considering the origin of life. The Accursed Fig Tree (Le figuier maudit), 1886-1894. A passage recorded in Matthew and Mark seems somewhat enigmatic. 3 comments are in order. Firstly, we must be careful how much we read into the word "immediately." It appears to be used frequently to keep the narrative running. It is common in Mark (though not used here). Within a time focused culture such as ours "immediate" implies right now, this second, no delay. While I guess this sense may be used by 1st century Jews, I am less certain it is required. Secondly, while I have no doubt the tree died at the moment Jesus cursed it, the question is when was this noticed? An animal's death is obvious to people at the very point of death. For plants the process is different and the outward changes are delayed. To be withered to the roots within one day is "at once" for a tree. Thirdly, and most importantly, if the precise sequence in Mark is correct, which I suspect it is, then Matthew is conflating two episodes. Matthew wishes to discuss the fig tree episode in a single passage. The cursing of the fig tree occurs on the morning Jesus casts out the money changers. Matthew holds back on mentioning the speaking of the curse until the latter discussion about the disciples marvelling at the effect of the curse. He is following a more topical arrangement in this section. But why the curse, especially if it was not the season for figs? I do not know much about horticulture or the life cycle of fig trees. There is some information on figs over at Plant Encyclopedia. Fig trees are apparently deciduous and sprout fruit in spring and autumn, though related species can be evergreen or sprout fruit year around. 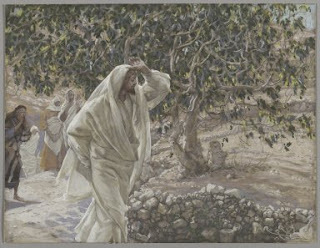 The cursing of the fig tree occurred after the triumphal entry and before Passover, that is ~Nisan 10 and early spring. The passage indicates Jesus uses the episode to teach his disciples about faith. It is likely that this was Jesus pronouncing a judgment on Israel for failing to recognise him. The episode occurred at the time of judgment concerning the temple, and fig trees are used as a symbol for Israel (Hosea 9:10). Interestingly Jesus tells a parable a year earlier. Here Jesus is alluding to his ministry. He has ministered to Israel for 3 years. Israel have failed to produce fruit in keeping with the coming of the Messiah. The owner wishes to remove the tree but is convinced to leave it a further year. Jesus will minister for a further year but if Israel still fails to produce fruit then they will come under a curse. The parable is a warning. A year later when Jesus ministry was at an end Israel had still failed as a nation to appropriately recognise the nature of Jesus. The real curse of a real fig tree was symbolic of judgment on the nation of Israel for failing to be fruitful by responding to Jesus. Job is an fundamental book if one is going to discuss suffering. It is important both for understanding the issue of suffering in our world, but also to encourage those who are suffering. I have found Job difficult to understand and I do not think think is unique to myself. The early chapters being narrative seem relatively straight forward, though there is a wealth of information encased there. But the poetical exchanges between Job and his friends seem more complicated theologically. I have read Job several times and have recently come to a conclusion that helped me make sense of the dialogues. Job makes several claims, many of which seem true, though he still complains to God. God confronts and rebukes Job, yet later tells Job's friends that Job has spoken right of him and they have not. So at least some of what Eliphaz said was correct. The conclusion I have come to is that Job what a type of Christ. Much as Joseph and Elisha are types of Christ in various ways so Job is also, in the sense that he is a righteous man suffering unrighteously. The fault of his friends is not always in what they state if one considers it from a proverbial perspective, rather in their misapplication to a righteous man. The introduction to Job serves as a framework with which we can interpret the dialogues. In the first 2 chapters of Job we are given an insight into a divine dialogue that Job what ignorant of. Satan brings an accusation against Job. Tellingly he is given the name Satan which means "accuser" or "adversary." Job's friends make statements that may be correct in some situations but are not in this situation, or they apply proverbs that are generally true but not specifically true. Because Job is a righteous man his friends are accusing him wrongly and are judged by God for this. If we consider Job a type of Christ then consider how Job's friends would sound if they made the same accusations against Jesus. It is not that what they are saying is always incorrect, but they are certainly incorrect in applying these ideas to Jesus. I suggest reading thru Job and reading the comments by Job's friends as being directed to Jesus and considering how that affects your perception of them and your reading of Job. Because of this God rebukes Job for what he does not understand. God corrects Job where he sins, but Job's friends accuse him of sin when he is acting in righteousness. One atheist complaint about God is why is the evidence for him not clearer? Why do we have to search so hard for it? Should it not be obvious? I actually think the evidence for God is clearer than what is claimed. However Keith Ward raises an interesting point, especially given the atheist penchant for science. The irony Ward identifies is remarkable. Scientific evidence is not obvious prior to the fact. But even more damning is that the scientific method was not particularly obvious. It was late on the scene and only originated in a single culture. And even now when we understand how the scientific method operates, unravelling the workings of the world takes considerable effort. What's more, evidences for God—the design argument and the moral argument—were known about centuries before science. Many cultures understood this evidence for God for millennia; yet the scientific method, which so enamours the materialists, took a long time to be identified. Further, the development of the philosophy of God (theology) proceeded significantly while men struggled to progress in natural philosophy (science) due to their unwarranted devotion to Aristotle. It seems that the evidence for God is indeed much more accessible to man than science. [Eternity] is a real duration, a real persistence of a sort that is imitated in time. Joe Carter has written a useful article about income equality that I think Christians from both sides of the political spectrum it should read. Incomes are measured in money—and money is not wealth. The existence of income inequality is generally a sign of a fair distribution of incomes. Both low and high rates of income inequality can be signs of unfairness. Income inequality and poverty are separate issues. No one in America is really concerned about absolute income inequality. Discussions of income inequality are almost always about redistribution of income. The focus on income inequality is at best, useless, and, at worst, immoral. Note that the essay is about income inequality and not poverty. One can be concerned about poverty but not income inequality. It makes a difference if your money is a result of creating wealth or just taking it, especially if you take it directly from the poor. This may include aspects of the finance industry.